Being a part of the Engaged fam is a pretty sweet gig. You could say our sun-lit studio is our sweet spot! (Too much?) Nothing gets our sugar cravings revved up like when Melissa Gray of Cakes by Gray walks through the door. We always know we’re in for a treat, every single one of our senses. Melissa’s cakes are…well…more than cakes. They’re works of art. They’re innovative. They’re a step beyond what Willy Wonka himself would’ve envisioned should he have expanded into baking. In other words, when you’re working with Cakes by Gray, you can forget about Pinterest. Melissa is the groundbreaking tastemaker you’re looking for, and she’s right in front of you. Featured in prestigious publications that include The New York Times and American Cake Decorating Magazine, Melissa is the down-to-earth mom of two you’d never know was raising the bar of the cake art world unless you know her and her work. Her affable personality and quick wit make her so much fun to be around…almost as much fun as her cakes are to taste. 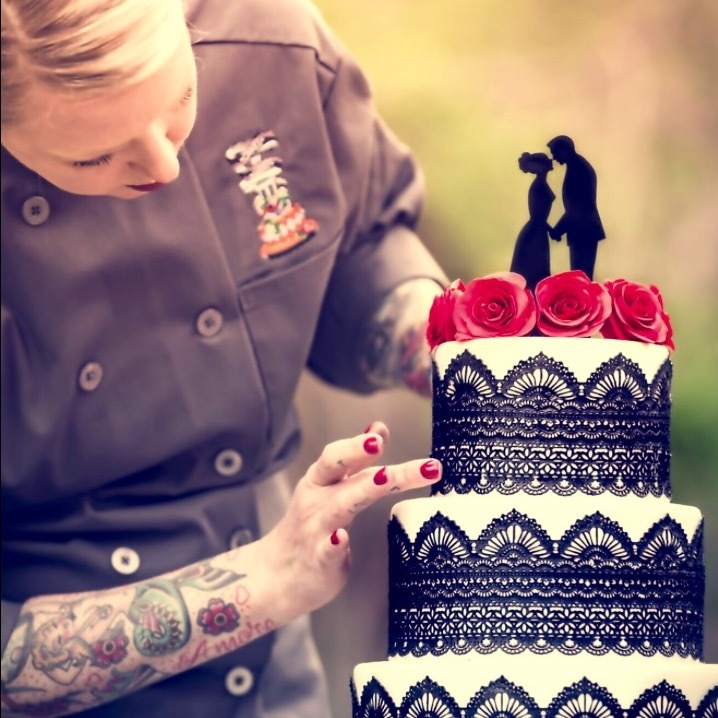 As a classically trained pastry chef and with an extensive background in the restaurant industry, Melissa knows how to deliver on flavor and presentation, modernizing the wedding cake industry one tier at a time. We’re so happy to share a little bit more about Melissa and Cakes by Gray on the blog today. 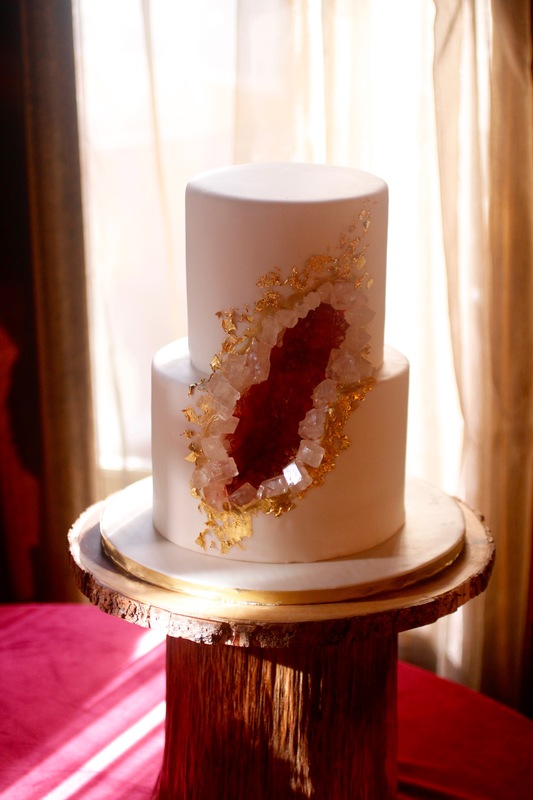 Without further ado, we’re thrilled to let the cake master herself tell you more about her innovative concept for designing truly unique wedding cakes. First and foremost, I am a chef, so flavor is just as important to me as design. My whole concept is based on unusual flavors and unique design executed to the highest degree. I’m constantly researching modern wedding cake trends to inform my art while always taking an individualized approach to each wedding cake. I commit myself to the highest quality of work to ensure my clients get both the wedding cake they deserve and the sweet respite from stressful wedding planning they need! Absolutely no detail is left untouched so no crumb goes uneaten. 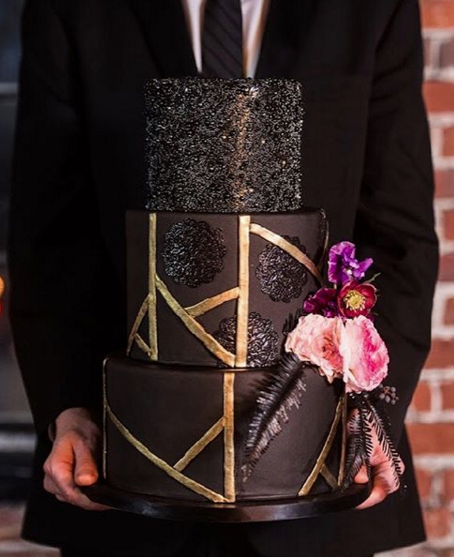 Whenever anyone asks me to define my style of wedding cake design, I like to say it embodies the Asheville ethos — always breathtaking, sometimes quirky, and definitely one of a kind! I love working with brides who like to think outside of the box and try new things. Sugar flowers and ivory buttercream icing are lovely, but what do they say about you? 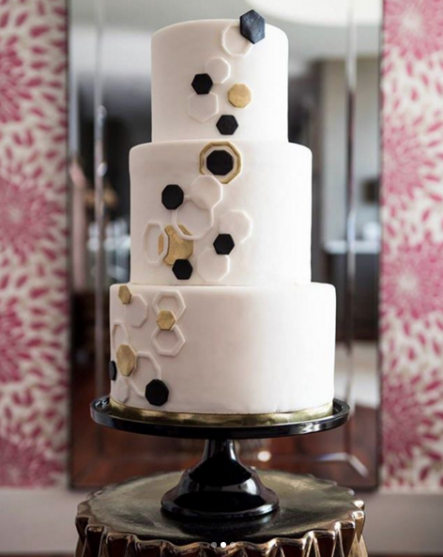 Any shape, print, or pattern that gets your bell ringing, we can talk about how to incorporate it into your wedding cake! And that’s just with the design. We haven’t even talked about all the exciting things we can do with the flavors…so let’s get to that, shall we? Did you ever bite into a dessert, sure of what to expect, only to discover an entirely new taste that dazzled your taste buds? That’s the experience I love to help couples give their guests when serving their wedding cake. My one-of-a-kind concept on cakes extends beyond the design and into the cake itself. The frosting, the filling, the fondant…they can all be as bright and bold as you want them to be! From classic to unconventional, I love serving up unique combinations that stand out in the mind and on the palette. We’ve all had strawberry cake. But have you tried strawberry cake coated in basil buttercream icing? Pineapple, pumpkin spice, or pink champagne cake. Chai, coconut, lavender, or lemongrass icing. Marshmallow fondant over a Funfetti cake? With a side of wine-infused gummy bears? Why the heck not?! I love exploring and experimenting with nontraditional flavors to provide endless inspiration for my couples. They can always request specific flavors of cake and icing to sample during their tasting in addition to my standard offerings. I also offer vegan, gluten-free, and Paleo options for any couples with specific dietary needs. Here’s a just a small sampling of flavors I offer, with new ones always in the works! *For a full list of flavors and for my Dessert Bar item list, the Flavors page on my website has them all listed out for you. You can also see what I include in my tastings on its dedicated page. Be sure to keep an eye out for exciting things coming from Cakes by Gray this year! Melissa’s latest feature in the bridal edition of American Cake Decorating Magazine comes out this July. In the meantime, we do have it on good authority that there are some crazy-cool things in the works for 2018 that are still under wraps, so be sure to stay tuned to Cakes by Gray for when they release. 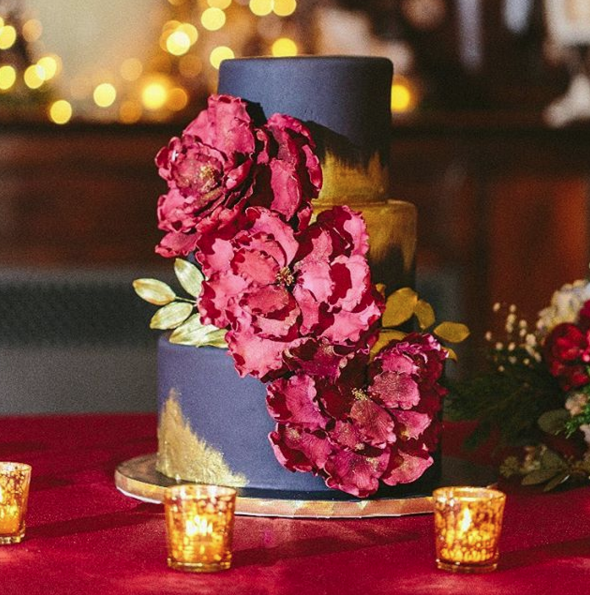 Melissa Gray is an award-winning cake artist whose signature style embodies the Asheville ethos — always breathtaking, sometimes quirky, definitely one of a kind — and absolutely delicious. 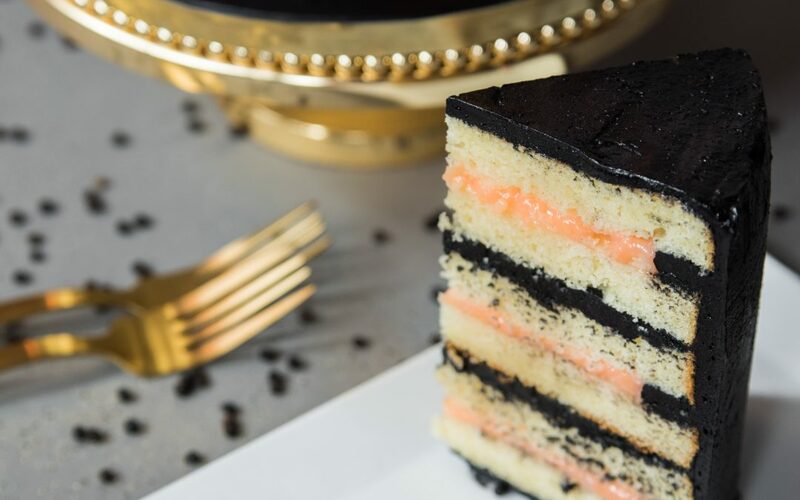 Her original flavor combinations recently scored her a published recipe in American Cake Decorator Magazine, and now her stunning creations are available for weddings throughout the Asheville area. Melissa’s classical pastry skills, natural artistic talent, and meticulously precise technique are matched only by her obsession with exquisite taste, divine texture, and continually stretching the limits of what’s possible (with cake). *It’s not all sugar flowers and buttercream, though! Cakes by Gray also specializes in distinctive dessert bars that feature everything from gourmet cake pops to gummy bears made of wine. To contact Melissa or to learn more about Cakes by Gray, please visit her official website.